Motorcycle Safety – Dress Right When You Ride! Every year more and more motorcycle enthusiasts will take to the roads. If you are one of them, make sure you are safe. According to 2018 reports from the Governors Highway Safety Association (GHSA), a nonprofit organization representing state highway safety offices, nearly 5,000 people were killed on motorcycles in 2017. That’s significantly higher than passenger vehicle occupant fatalities. One of the most logical steps to reduce the risk of serious injuries while riding a motorcycle is to always wear appropriate safety gear. While a helmet is the most important piece of equipment you can wear to reduce the risks of death and traumatic brain injuries, there are other additional pieces of gear that will help you be safer when riding. A good pair of gloves will allow you to grip the handlebar more efficiently, and also protect your fingers and hands in the event of an accident. Wearing a reinforced motorcycle jacket will not just make you look better while riding, but also help protect your upper body from severe injuries. A sturdy neck collar will lend additional stability to your neck area, and also help protect your collarbones. And finally, a good set of boots can help protect both your feet and your ankles in the event of an accident. If you or a loved one have suffered injuries in a motorcycle crash due to the negligence of others, you deserve proper compensation for the costs associated with the accident, resulting medical expenses, and lost wages. 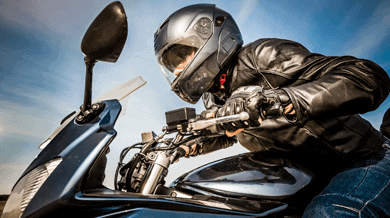 The experienced Motorcycle Accident Attorneys at Fenstersheib Law Group, P.A., have successfully handled hundreds of accident cases over the past three decades. Call 1-800-TellRobert for a free initial consultation – we will evaluate your accident claim free of charge, fully explain your legal rights, and work aggressively on your behalf to try and get the maximum compensation you deserve for your pain and suffering. Our phones are answered 24 hours a day, 7 days per week. Home > Accidents > Motorcycle Safety – Dress Right When You Ride!